ACS put the above quote (in quotes) into google and got 682 hits. It is attributed to Michael Specter. Michael Specter (born 1955) is an American journalist who has been a staff writer, focusing on science and technology, and global public health at The New Yorker since September 1998. His book seems not to cover the man-made global warming debate, however the non-science of the "consensus" scientists has surely contributed greatly to the the public's mistrust of the scientific community. claimed "The climate of the future is what we make it...,"
A true skeptic is willing to look at all of the scientific evidence available and is willing to analyze it without bias. 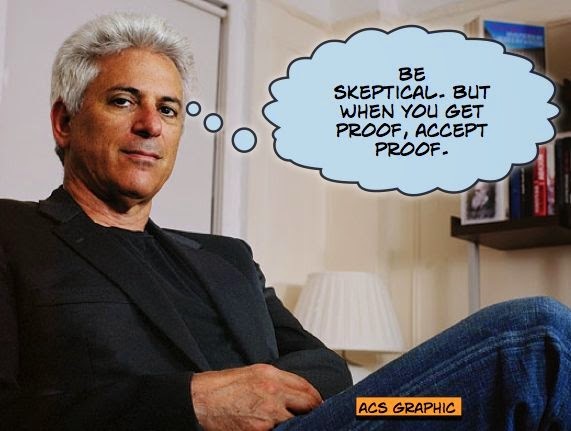 When the evidence says something, a skeptic can accept the outcome before them…until new evidence is presented. After temperatures rise, on average it takes 800 years before carbon starts to move. The extraordinary thing is that the lag is well accepted by climatologists, yet virtually unknown outside these circles. The fact that temperature leads is not controversial. It’s relevance is debated. Journalists like Michael Spector with no real education in the world of science would have benefited by tuning into the recently broadcast PBS series "Cosmos: A Space Time Odyssey" hosted by Neal deGrasse Tyson. Most viewers can retain a better understanding of the world and lose inherent bias with education, certainly worth the time spent. Nice to be able to write to you. The "scientific process" was never followed. A theory should be subjected to critical/skeptical review. It should be verified by testing. In the case of global warming, models were developed which contained the elements of the theory, mainly CO2. The development sample was the period of warming from 1978-1998. CO2 was so weak that it's warming had to be tripled using the assumed feedback of water vapor. (They neglected to note that clouds and precipitation offset that feedback) When the models were tested by trying to predict temperatures in an independent sample starting in 2000, they failed to reproduce actual temperatures. The models forecast temperatures to keep rising, while actual temperatures remained flat till the present day. Since they failed, the theory is brought into serious question. It is clear that global temperatures are governed by natural forces not included in the models..